Karol G is in love, in demand and intent on winning us over. Slip dress, $675, and decorative gold earrings, $2,195, both at Dolce & Gabbana; hat, price upon request, by Fernando Garcia at Pinkgun Gallery, 786.514.3245. She shows up smiling, in terry sweats and blinding white high-tops. Her manicured nails are encrusted in coarse gold glitter that catches the light. Her lashes look like sea anemones encasing expressive brown eyes. And her hair, dark beyond the roots, ombre splits into a blond ambition that is loosely curled. 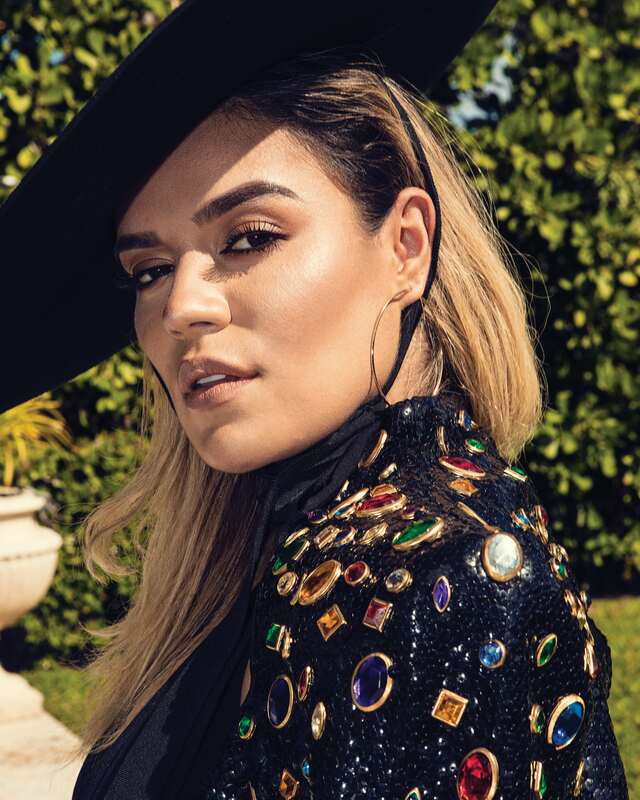 Meet Karol G, the Colombian-born 28-year-old singer who clocked over 100 concerts last year throughout Europe, Latin America, Asia and the United States. She boasts 14 million Instagram followers, chart-topping urban beats and collaborations with Bad Bunny, Luis Fonsi, Maluma, Nick Jonas and many others. Bold, eloquent and unabashed about showing her backside in barely blushing swimsuits, this paisa bombshell was crowned best new artist at the Latin Grammy Awards. And yet, she’s still not a household name among English speakers. That's about to change. "The world is tuning in to Spanish music,” says Karol G, whose new album, Ocean, comes out in May. “Every Latin musician wants to cross over quickly, but for me it’s been a slow and deliberate quest." In other words, despacito. “Luis Fonsi’s hit opened doors,” she continues, “and now the U.S. market wants to be in our space.” And why not? Films like Oscar-winning Mexican import Roma and Netflix series Narcos prove that millennials crave first-language authenticity. “This is our moment,” exclaims Karol G.
Sequin blouse, $990, by Attico at The Webster; hoop earrings, $420, at soledadlowe.com. And to think she almost gave up on her moment. “I started young,” she says. “We were three girls, and my dad poured everything into our music studies. You name it: guitar, private voice lessons, reality show auditions. He was determined to turn one of us into a musician.” Her father, beloved in the Latin media as Papa G, was once an aspiring musician who traded dreams for steady paychecks. At 15, Karol G was cast in Colombia’s The X Factor. It led to her first record deal. “I did everything to break in,” says Karol G. “I even recorded covers of Alicia Keys and Lauryn Hill, and put them on YouTube in the hopes that Drake would discover me like he did Justin Bieber.” (Those covers still live on YouTube.) Eventually, she grew frustrated and gave up. But Papa G was not ready to quit. He allowed his daughter to move to New York City to study English, but made it clear that the only thing he was paying for abroad were music lessons. As Karol G downloads a new romantic ballad she has recently written, her sultry voice fills the room, accompanied by piano chords and ocean waves. “I can’t wait to share this with the world,” she whispers. The world is ready to dive in. Jacket, price upon request, maryjaneclaverol.com; Mio halter swimsuit, $160, by Norma Kamali at Neiman Marcus; hat, price upon request, by Fernando Garcia at Pinkgun Gallery, 786.514.3245; hoop earrings, $420, at soledadlowe.com. Tell us more about your new album, Ocean. KAROL G: It represents a growth milestone for me, personally and professionally. I worked with different producers from all genres, trying to bridge different styles of music, from urban to electronica to ballads. I put a lot of emphasis on the composition of the songs and the creative production. We finished it in Turks and Caicos because I wanted to capture the essence of the title. Imagine creating music in the middle of the sea. Spectacular! KG: A percentage of the profits will go toward cleaning the ocean. It is our job to make a difference and leave the world a better place. Last year, you were constantly traveling. This year, you are set to perform twice as much. What do you never leave home without? KG: My speakers. I listen to music wherever I go— everything from reggaeton to salsa. I even love old-school vallenatos and artists like Myriam Hernández. It’s what we call musica para planchar (ironing music). Vintage feather coat, price upon request, Pinkgun Gallery, 786.514.3245; earrings, $250, maryjaneclaverol.com; sunglasses and tights, both stylist’s own. You have a massive social media following, but last year you were on the brink of shutting down all your accounts. KG: I went through a difficult time, gaining 24 pounds in one month. A few haters attacked me online for how I looked, even though the majority of my fans were supportive. Those are the ones who kept me going. It turns out that my insulin levels were off and I had to undergo medical care. Thankfully, everything is under control now, but that taught me to love myself in whatever shape I am. That is why for my video for “Pineapple,” I highlighted women of all shapes and sizes. I wanted to get the message out that we need to respect ourselves and one another. You and your boyfriend, Puerto Rican rapper Anuel AA, have toured and recorded two hit songs together. Tell us about your relationship. KG: I actually hated his music style at first, but thought he had so much talent. Our first collaboration was “Culpables” (“Guilty”). We recorded it separately and spoke for weeks over WhatsApp, but didn’t meet face to face until filming the video. We took our time falling in love. I’m lucky to know a side of him that is rarely portrayed in public. He is super-romantic, thoughtful and thinks of every detail. Duchesse jacket, $3,345, and slip dress, $675, both at Dolce & Gabbana; earrings, $250, at maryjaneclaverol.com; ring, price upon request, by Fernando Garcia at Pinkgun Gallery, 786.514.3245. 1999 Lamborghini Diablo VT: Curated, wearecurated.com. Many people don’t know that you turn to extreme sports for relaxation. KG: I love fast toys, from boats to Jet Skis. My cousins are all into motocross back in Colombia, and I’ve always wanted to join them. They’ve gotten banged up from time to time, so my dad forbade it. Two years ago, I bought a couple of motorcycles. Dad is still getting over it. You have collaborated with just about every major Latin urban singer and reggaeton star. Who would you pick to be your next collaborator? KG: Rihanna. Do you think she’ll read this? I’ve always been a fan, and I keep hoping we’ll bump into one another at an event.